v. Donald Lee Ike Dickerson; m. Barbie Unknown. Flaudeen (Potter) Dickerson, age 87, of Wellston, passed away Tuesday, August 21, 2012, at the Holzer Medical Center in Jackson, Ohio. She was born July 26, 1925 in Yeager, Kentucky, the daughter of the late Andrew Jackson Potter and Eliza Johnson Potter. Flaudeen was five years old when her family moved to Thurman, Ohio, where she graduated from Centerville High School in 1944. 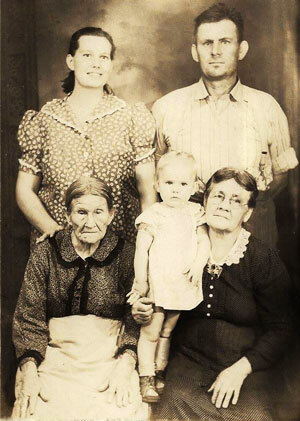 In 1946, they moved to Mulga, Ohio, near Wellston, where she lived the rest of her life. She was married to Buck Dickerson on November 25, 1947 and they had 42 wonderful years together. Her greatest joy was having her family together. She loved taking care of others and she worked many years as a caregiver and nurses aid. Flaudeen was an accomplished oak furniture maker. Her tables and bookcases are treasured by her friends and family. She loved the outdoors and her hobbies included exploring for Indian artifacts and antler sheds on her ATV. Flaudeen was a member of the Hope United Methodist Church in Wellston. She is survived by her children, Geraldeen Key (Michael) of Wellston, Thomas Dickerson (Rose) of Wellston, Richard Dickerson (Joan) of West Jefferson, Elizabeth Wittmann (Rick) of Winchester, Ky. and Donald Lee "Ike" Dickerson (Barbie) of Wellston; her sisters, Ethel Silvey of Jackson, Sally Fridenmaker of Centerville and Peggy Miller of Perris, Calf. ; grandchildren, Dave Kisor, Doug Kisor, Devin Kisor, Annie Dickerson, Abbigail Dickerson, Connor Dickerson, Jennifer Sparks, Jimmy Simpson, Will Wittmann, Donald Dickerson, Thomas Dickerson, Amanda Creamer, Katie Dickerson and Lyza Dickerson, as well as 15 great-grandchildren, two great-great-grandchildren and several nieces and nephews. Besides her parents, Flaudeen was preceded in death by her husband, Charles Gerald "Buck" Dickerson; son, James Andrew Dickerson; sisters, Charlotte Thomas, Jackie Davis, Evelyn Compton and Linda Hartley, and her brother, Abram Potter. Calling hours will be Friday from 6 to 9 p.m. at the McWilliams Funeral Home in Wellston. Funeral services will be Saturday at 11 a.m. at the McWilliams Funeral Home with Pastor Brian Vinson officiating. Burial will follow in the Mt. Carmel Cemetery.